Today is the 229th anniversary of the opening of the Constitutional Convention in Philadelphia, PA. Postcard US-4013590 to Germany was a 1987 14¢ postal card, the first of three issues by USPS commemorating the bicentennial of the Constitution. The card bears a multi-colored 14-cent pre-printed stamp on its upper right corner, depicting Independence Hall as it appeared in 1787. Built in 1753, the building now known as Independence Hall was the colonial legislature and later Pennsylvania State House for the Province of Pennsylvania. It was the principal meeting place where both the United States Declaration of Independence (July 4, 1776) and the United States Constitution (September 17, 1787) were debated and adopted. Recognized as a UNESCO World Heritage Site in 1979, it is now the centerpiece of the Independence National Historical Park in Philadelphia, Pennsylvania. 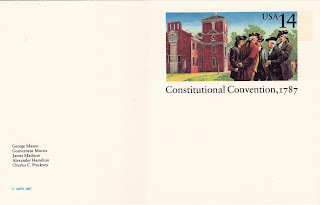 The multi-color design also shows five convention delegates: George Mason of Virginia, Gouverneur Morris of New York, James Madison of Virginia, Alexander Hamilton of New York and Charles Pinckney of South Carolina, standing to the right of what was then the Pennsylvania State House. All eventually signed the Constitution except Mason, who refused because he believed the Constitution gave too much power to the federal government. Their names are printed on the lower left corner of the card as well.. The first-day-of-issue ceremonies of the card was held in the courtyard of Independence Hall at 10:30 a.m. on May 25, 1987. The Fittest City in the U.S.